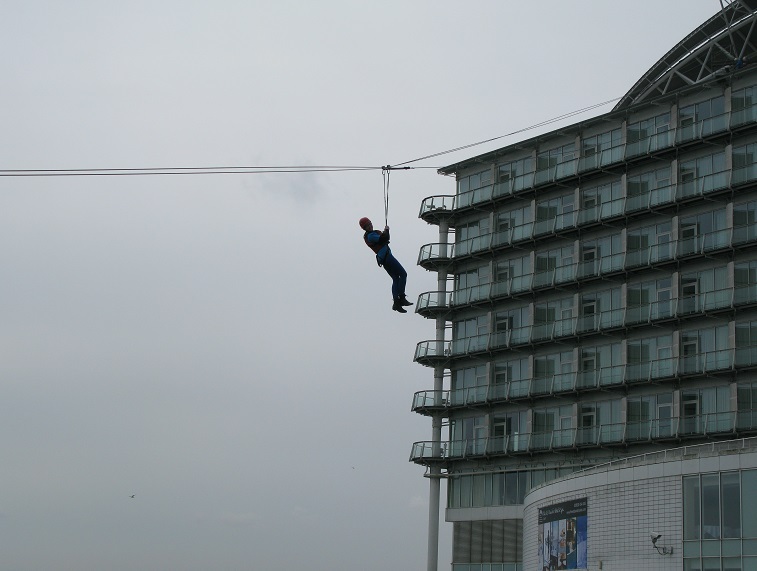 The St. David’s Hotel & Spa challenged daredevils of Cardiff to take part in a once-in-a-lifetime zip wire challenge today in Cardiff Bay in aid of the hotel’s charity of the year, Tenovus Cancer Care, Wales’ leading cancer charity. More than 70 people from the ages of 12 up to 92, took part in today’s zip wire challenge and, tomorrow a second round of adrenalin junkies will take to the skies with over 160 people taking part over the two days. The zip wire starts on the roof of the hotel and flies over Cardiff Bay, ending on a pontoon in the water. A minimum sponsorship of £100 was required for anyone brave enough to take on the challenge. The event quickly sold out and it is estimated that more than £20,000 will be raised for Tenovus Cancer Care as a result of the two day challenge. With a further 80 people pumped to fly across the Bay tomorrow, the fundraising total is still building. Tenovus Cancer Care works to fund vital research and bring treatment, emotional support and practical advice to where it matters most; the heart of the community. 62 year old David Fitzpatrick from Cardiff completed his zip wire challenge earlier today and has already raised almost £400 to support his brave efforts. People from across the globe have supported David, who was diagnosed with bladder cancer less than a year ago. He is currently receiving treatment and making a great recovery. He said: “It’s not every day that you have the opportunity to take in the fantastic views of Cardiff Bay from the air! It was a great experience and my screams could be heard for miles! The zip wire is the latest fundraising activity instigated by the hotel as part of their Charity partnership with Tenovus Cancer Care. Over the past year, the hotel has undertaken a variety of events for Tenovus Cancer Care, including hosting a Ladies Indulgence Night and launching the Tenovus Tempus, a new charity cocktail for the hotel’s bar. Designed by Tenovus Cancer Care Patron Sian Lloyd, the cocktail is available at St David’s Tempus at Tides restaurant and bar, with 50p from the sale of every cocktail going directly to the charity. Nicola Edmunds, Director of Sales and Revenue at the St David’s Hotel & Spa said: “The zip wire challenge has been so much fun to organise and we are very touched by the number of people who are taking part and supporting this fantastic charity. “We are delighted to be working with Tenovus Cancer Care for another year as this is a charity which is close to all our hearts. This zip wire is just one of many fundraising activities that we have organised for the coming year in aid of Tenovus Cancer Care. Claudia McVie, Chief Executive of Tenovus Cancer Care said: “We couldn’t provide our services, support and carry out research without the support of local businesses such as the St David’s Hotel and we are very grateful for their support. We really value our corporate relationships and are proud to work in partnership with The St. David’s Hotel and Spa to help more people affected by cancer.